While E3 2018 might not have been a hot show for Ubisoft in terms of new game announcements, it sure paved the way for some exciting looks at titles that have already been announced. Games such as Skull & Bones, which demoed extremely well during my appointment, as well as Assassin’s Creed Odyssey, an extension in gameplay of the last year’s excellent Assassin’s Creed Origins, set nearly four hundred years before Bayek’s adventure, and of course the still very far from being released Beyond Good and Evil 2, which now featured beloved characters from the original game during its trailer at Ubisoft’s conference. Tried and true online powerhouse games that have been out for a while also made it into Ubisoft’s E3 portfolio. Like the welcome announcement of continuing support for For Honor, that will introduce a new faction into the conflict, the Chinese, as well as the promise of new content up until at least the end of 2018. We also saw the same sort of support for Rainbow Six Siege, which is now entering its third year of content drops and seems to be doing extremely well in the competitive scene. A little bit differently than Siege and For Honor, but in a similar vein, The Division is also getting its own support drop, but in preparation for the upcoming release of its sequel next year. New shield items that will come from completing special challenges will carry over to the new game, and from my time playing the demo at Ubisoft’s press space at the show, we’re gonna need all the help we can get in The Division 2. Unfortunately, due to a power failure that rendered the demo stations inoperative for most of my demo, I was only able to play through about 2/3s of a four player cooperative scenario. But from the little that I did play, The Division 2 felt like a solid, ultimately safe sequel, so I’ll probably be jumping back to the original while that’s still not out and knock that off my backlog before starting the new one. 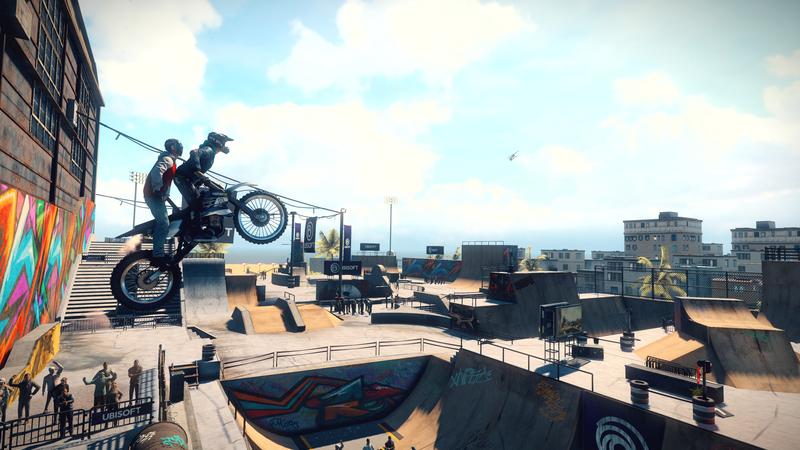 Another sequel that looked good and played well at E3 was Trials Rising, which to all intents and purposes is a jump back to the Trials Evolution era of the franchise, doing away with all the future shenanigans from Trials Fusion. As a big fan of Trials HD and Evolution back on the Xbox 360, I was very keen on giving Rising a shot after its introduction during Ubisoft’s conference, and it did not disappoint. The new feature that I most appreciated was the ability to have two players control the same motorcycle, by having them split the gas pedal pressure and steering among themselves. It made for a pretty chaotic experience at first, as the dev giving me the demo tour and I attempted to complete a simple course and utterly failed. Still, after a couple of tries, I eventually got the hang of it, and we got through a few of the easier tracks. The inclusion of quests and missions also felt like a welcome addition to the game. Although not incredibly difficult to pull off at the early tracks that I played — and frankly not at all generous with rewards, only giving out cosmetic items that I could make my poor rider wear — these are sure to help bump up the replayability considerably, along with the leaderboard fighting among friends that made the original games so much fun to furiously play and conquer better and better track times during the previous console gen.
As for other safe bets that Ubisoft has been taking for years now is Just Dance 2019, another entry in their party dance game that’s the sole reason the Wii is still listed in online stores. Yes, the original Wii is still getting games released for it in 2018, and if Ubi has anything to say about it, it’ll probably keep doing so for a while. It made for a fun spectacle during their press event, with live performers (including a freaking panda!) dancing their colorful costumed behinds off on stage. This year was also a big year for Ubisoft in terms of Hollywood stars making quick appearances during their conference, like Elijah Wood, who was once again on stage talking about his upcoming thriller/horror game Transference, as well as Joseph Gordon-Levitt, whose company creation HitRecord is set to handle the user created content side of Beyond Good and Evil 2. 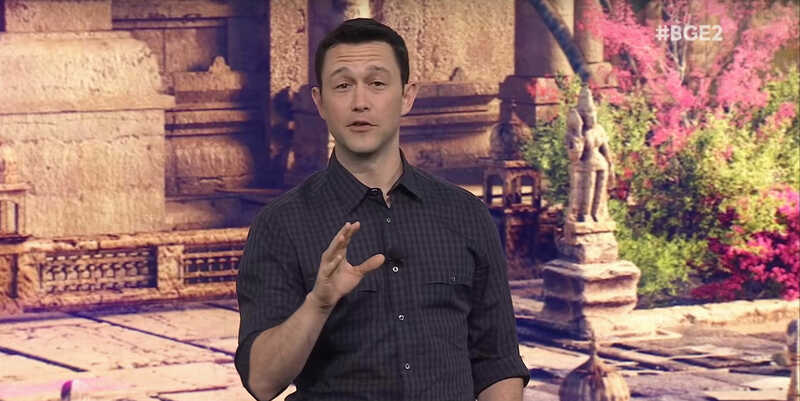 That was a part of the presentation that raised a few eyebrows during the presentation thanks to some unclear delivery on how creators would be paid for their work in-game, something that has since then been somewhat clarified by Gordon-Levitt and that hopefully should be getting even more details as the game approaches release. I for one, as somewhat of an aspiring artist myself, would hope that this aspect of the game will go beyond the mere fable of featuring people’s art for exposure and only pay for the pieces that are actually used as art in-game, but we’ll see! Ubisoft’s also throwing their hat into the toys-to-life pile (maybe a little too late?) with their previously announced Starlink: Battle for Atlas, now coming out in October. The big news is that StarFox will be joining the cast in the Switch version of the game, complete with an Arwing physical ship attachment, which once again saw Nintendo star Shigeru Miyamoto timidly step onto the stage for the announcement, if only for a few moments. We had the opportunity to play a bit of that during our time with Nintendo at the show, and it played like a decent space shooter with cartoony graphics. Sadly, Callum and I did not get near the actual toy attachments, but the game itself played rather well. Closing off my impressions, there’s not much to comment on The Crew 2. It got a quick trailer during the presentation, and since it’s so close to release, I hope to get an opportunity to check out the final version sometime soon. I wasn’t particularly in love with the original, so I’m cautiously curious about what this land-to-air-to-water sequel is all about. As for previews, please look forward to my coverage of my E3 appointments with Skull & Bones and Assassin’s Creed Odyssey in the next few days.